Australia's tour of India went into crisis mode on Monday with the team management axeing four players, including vice-captain Shane Watson, from the third Test in Mohali for ignoring team orders following the defeat in Hyderabad. 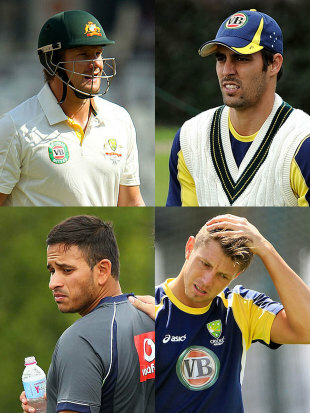 The other players are James Pattinson, Mitchell Johnson and Usman Khawaja. Hours after that announcement by the coach Mickey Arthur came news that Watson was heading home, though Cricket Australia insisted it was connected with the birth of his first child. The baby was due shortly after the end of the Indian tour and Watson had already been granted leave to fly home early if required. A Cricket Australia spokesman said that process had been "accelerated" due to a change at home and that it was yet to be confirmed whether Watson would return to the tour ahead of the fourth Test, which starts in Delhi on Friday next week. The four players were told by Arthur of the unprecedented decision on Monday morning. After the Hyderabad loss, inside three and a half days, Arthur asked every member of the squad to let him know three points on how their individual performances and those of the team could be improved. The players were informed of the task on Tuesday night and were asked to ensure it was done by Saturday evening. Every other player completed the requirements, either by emailing or texting Arthur their points or by slipping a note under his door. However, as of Monday morning the four players had neglected to comply. Arthur, captain Michael Clarke and team manager Gavin Dovey met and discussed how to handle the situation and decided that it needed to be a "line-in-the-sand moment". "After Hyderabad the whole team was really hurting, we were discussing ways of getting back into the series," Arthur said. "We were particularly aware of where we were as a team and how we were going to get back. I asked the players at the end of the game to give me an individual presentation. I wanted three points from each of them technically, mentally and team as to how we were going to get back over the next couple of games, how we were going to get ourselves back into the series. "Unfortunately four players didn't comply with that. We pride ourselves on attitude. We have given the players a huge amount of latitude to get culture and attitude right. We believe that those behaviours with what we want to do with this team, how we want to take this team to be the best in the world, teams that are the best in the world have best attitudes and best behaviour patterns and a good, hard, ruthless culture. I believe those four players unfortunately did not meet my requirements so those four are not available for selection for this Test match. "That's a line-in-the-sand moment. We have given these guys absolute clarity. We have given this team a huge amount of time to buy in with what we want to do for the Australian cricket team. We have given a vision to these guys that is spelt out. We've given an expectation that is spelt out and although this incident might seem very small in isolation this is a line-in-the-sand moment for us as a unit in our quest to become the best in the world. "I think the best thing that these three days off have given me is reflection time, to reflect on how well have I been going in my job, like I expect everyone else to do when you're 2-0 down in the series. Myself and Pup came to the conclusion that we have been so focused on winning cricket games that maybe some people have been cutting corners. Perhaps there have been some soft options taken. "We decided that we needed to really get that in line." One of the most surprising aspects of the decision is that it was not necessarily related to previous indiscretions by the players involved. Although there have been ongoing questions about Khawaja's attitude, Arthur said Watson, as one of the senior members of the side, was usually extremely professional with his preparation. But on this occasion, given the nature of the loss in Hyderabad, the team management was not prepared to accept such laxity. "I have never ever doubted, not for one moment, the drive of Shane Watson," Arthur said. "Not for one moment. Shane Watson prepares well. He's very professional and he goes about his business in a very professional way. I've not ever been in a position to doubt Shane Watson the person or Shane Watson the cricketer. Usman Khawaja is different. This will be the catalyst I think for Usman Khawaja to realise we're pretty serious in the Australian cricket team. "It's extremely tough to sit here and make that decision. I wish it wasn't the vice-captain, I wish it wasn't Shane Watson and Mitchell Johnson, they are leaders within the team and are very professional with the way they go about their business. But this was a moment where we had to make a statement irrespective of who the players were. "I wanted to make 100% sure that it wasn't stuck in the outbox and under the door, and it wasn't. Shane was going to talk to me today about it, as was James Pattinson apparently. Mitchell and Usman forgot about it. But I wanted it by Saturday night. As severe as a consequence it is, if we remove the names, it sends a proper statement of what we want to do with this cricket team. "That's a line-in-the-sand moment. We have given these guys absolute clarity. We have given this team a huge amount of time to buy in with what we want to do for the Australian cricket team"
"They could do it in any way. It could be in writing and putting something on email, it could have been sending an SMS followed up by an email. I wanted to make sure the players went back and reflected and looked themselves in the mirror and said 'this is what I want to do to take this team forward. This is how I want to change this series and this is my positive contribution to the attitudes that we want to create in this cricket team'. "I wanted three things - a lot of guys came to my room and did a presentation, a few guys have written fantastic emails, some guys put notes under my door, it was their preference. As a leadership group, myself, Michael Clarke and Gavin Dovey made these decisions together. We as leaders feel we need to project a united front and we need to be ruthless if we want to achieve our objectives." The players were informed of the decisions individually on Monday morning before the news was broken to the rest of the playing group prior to training. Arthur said it was a very difficult decision. "They are absolutely gutted, as I was having to deliver a message like that," he said. "We were all gutted by it, but this is the expectation if you want to play cricket for Australia." The decision leaves Australia with only 13 players available for the third Test, which starts on Thursday. However, Matthew Wade may yet be ruled out due to injury, which would leave only 12 available when Brad Haddin joins the group. The unavailability of the quartet is only for the Mohali Test; they will again be considered for selection for the fourth and final Test in Delhi.